Well, we did start our coverage about Chinese Scientist with a joke about all they need is funding. It seems to be more prolific than we thought. Not only is the financing for the project in question, so are the true intentions of original news release. A fresh campaign to find "Bigfoot" - a legendary half-human, half-ape figure - may be suspended due to a lack of financial support, according to the archaeologist overseeing the project. Two days after a global recruitment drive was announced to find volunteers for the search team, the organizer said funding might prevent them from going after the ape-like creature. The Hubei Wild Man Research Association announced Saturday that they were looking for team members between 25 and 40, with good physical health and knowledge of biology. However, Wang Shancai, founder of the association, told the Global Times Monday that there is no detailed plan for the recruitment drive as they are still looking to raise enough money to support the exploration. He said they want to prove or disprove the existence of Bigfoot in the Shennongjia area. More than 400 people claimed to have seen Bigfoot in the Shennongjia area over the last 100 years including villagers, reporters, tourists and explorers. However, there has been no hard evidence to prove its existence, the Xinhua News Agency reported Sunday. Wang is hoping that this renewed effort could put the Bigfoot mystery to rest. "We encourage any companies, social groups and the public to donate or cooperate with us and contribute to the reso-lution of this long-term mystery," said Wang, who is also a researcher with the Hubei Provincial Institute of Cultural Relics and Archaeology. The planned year-long exploration needs 10 million yuan ($1.5 million) and some 50 people to work in small teams. The exploration will focus on the area around the Shennongjia Natural Reserve, a 76,950-hectare forest in Hubei Province. Wireless cameras will be installed in caves to capture tracks of Bigfoot. Witnesses have described Bigfoot as a creature that is more than 2 meters tall, walks upright and has a gray, red or black hairy body. The last organized expedition to find the mysterious creature was in the early 1980s. The new Bigfoot expedition has triggered controversy on the Internet with some saying the exploration is a campaign to boost tourism. Tourists to Shennongjia surpassed 1.66 million in 2009 and brought in 550 million yuan ($82 million) to the region. The Shennongjia area reported a 70 percent jump in visitors during the 7-day national holiday, according to the Hubei-based Chutian Metropolis Daily. "Our exploration is a pure scientific research activity. We don't accept government subsides because we do not want to become their financial burden," Wang said. 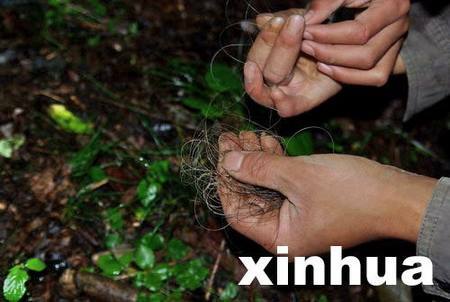 A documentary on China Central Television earlier this year said that some hair-like samples collected in Shennongjia, which were suspected of belonging to Bigfoot, turned out to be a new type of fungi that was not discovered in the region before.